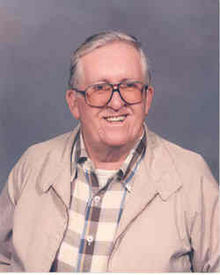 Phil Whitfield Winchester, Jr. passed away May 5, 2009 at Forsyth Memorial Hospital in Winston-Salem. Born December 7, 1933, he was the son of the late Dr. and Mrs. Phil W. Winchester, Sr. of Morganton. He was also preceded in death by two sisters, Barbee Winchester Hairfield of Morganton and Grace Winchester Peacock of Raleigh. A graduate of Duke University, Mr. Winchester was a retired engineering geologist and Asheville area tennis coach. He also served in the US Army during the Korean War. A longtime resident of Asheville and Fairview, Mr. Winchester had relocated to Mallard Ridge Assisted Living in Clemmons due to failing health. Survivors include 8 nieces and nephews. Funeral services will be held 1PM on Saturday at Lewis Memorial Park in the mausoleum chapel with the Rev. Jerry Wilson officiating. To sign Mr. Winchester's online register book visit www.moorefh.net.